In an increasingly globally connected world, staying in touch with cultural and historical “roots,” so to speak, has become ever more critical in the preservation of national identity. Indigenous peoples in the recent past have been under constant threat of factors such as displacement through colonial influence and/or centralized political systems, encroachment of adjacent outsider communities, and even their own cultural degradation from within. 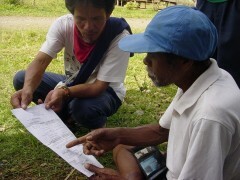 Thanks to established policies on both national and international levels (see box stories), not only have the rights of indigenous groups been appropriately defended and protected (their claims to ancestral domain among the most primary), their social support systems and range of opportunities have also been largely expanded. IPs and ICCs are now also encouraged to develop their skills and sustainable livelihoods. They are presented ample opportunities for capacity building and leadership training. With such opportunities to further develop their own authority and responsibility, indigenous groups can have more collective ownership of their own socio-economic development, with their local natural riches serving as the number one resource at their disposal. The participatory process to promoting and implementing biodiversity conservation forms a key section in the Convention on Biological Diversity’s (CBD) Program of Work on Protected Areas, a globally recognized concession comprised of 16 goals collected for the management of protected areas. Element 2 is an entire section on “Governance, Participation, Equity, and Benefits-sharing,” under which Goal 2.2 talks specifically about the involvement of indigenous and local communities, “in full respect of their rights and recognition of their responsibilities” in the management of existing and new protected areas. The said involvement and participation are recommended to begin from the level of contextualization and status reviews, then carry over to the planning process, tapping into the wealth of inherent knowledge that IPs and ICCs possess – all in an effort to empower and enable them to further become proactive and relevant stakeholders. Also encompassed within the provisions of the Programme is the guarantee that any necessary resettlement of ICCs will take place with due consultation and consent in accordance with national and international policies. Here are a few more useful links to provide context on international policy’s all-too-important emphasis on reviving indigenous peoples’ role in biodiversity management and conservation. International Union for Conservation of Nature (IUCN). 2011. Indigenous and Community Conserved Areas: A Bold New Frontier for Conservation. Last updated on April 26, 2011, http://iucn.org/about/union/commissions/ceesp/topics/governance/icca. Convention on Biological Diversity (CBD). Undated.Programme of Work on Protected Areas. Last accessed on October 4, 2013, https://www.cbd.int/protected/pow/learnmore/intro.